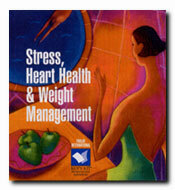 Understand heart disease and its relationship to stress and weight. This popular kit is an ideal resource for general health promotion, patient education and cardiac rehabilitation. Topics include the physical and emotional effects of stress; stress management tips; cardiovascular diseases; health effects of high-fat diets and being overweight, and much more. Approach or Avoid: How Do You Cope With Stress? Dedication or Addiction: What's Driving Your Work Habits? The Balancing Act: "You First" or "Me First"? Does Stress Increase Your Risk of Cancer? Heart Murmurs: How Serious Are They? Does Aspirin Prevent Heart Attacks?